As the nation began to become familiar with the plight of the family of Cliven Bundy, many of us harkened back to another standoff in which the Federal government attempted to bully it's outcome: Waco, Texas and the Branch Davidian massacre. It is telling that in the Nevada case the feds pulled out so quickly, given all they had indicated they were willing to do to resolve the matter to their satisfaction. They had set up a perimeter around the Bundy's family land, ranch, and home. They had brought in extra artillery, dogs, and snipers. They were beginning the process of stealing more than 300 head of cattle that did not belong to them. They did so--or so we were told--for the reason of protecting the desert tortoise. But then it was revealed that the Bureau of Land Management had shot far more desert tortoises than the Bundy cattle had even possibly destroyed. We were told they did it because the Bundys had broken federal laws by not paying what amounted to retroactive grazing fees to the federal government. But the Governor of the state of Nevada told us that Bundy had paid every ounce of state tax, met the state requirements, and their family had been improving the property more than 100 years previous. Finally we were allowed to know the connection between a communist Chinese wind/solar power plant and its connection to that senator named Harry Reid. Evidently a plan had been hatched to use the Bundy property for a solar farm and instead of paying the Bundys, someone, somewhere in the administration believed it was easier to just take what they wanted. That approach is at least consistent with the readily documented abuse of eminent domain where the government for any number of reasons--few of them valid--have taken to taking what doesn't belong to them. Americans then watch as it gets handed over to some multi-national corporation for the "cause" of the "greater good." 1. Technology - As the Bundy family members were abused, cameras captured it. Not television network cameras, but dozens of cell phone video devices that gave witness to a Bundy aunt being shoved to the ground, and a Bundy son being tazed. All of this while threatening protestors with dogs, brandished weapons and vehicles was captured, uploaded and made viral to the watching world. 2. States' Rights - As the drama unfolded it became clear that the Governor of Nevada, and the Sheriff of Clark County knew that Cliven Bundy's family had not only not broken any state law regarding the land, but that they had gone to the enth degree to insure compliance with Nevada laws on the property. The Governor and the Sheriff, to their credit, did not favor the feds as a more powerful party in the conflict. Though there must have been pressure from Senator Reid's office, the administration via the Bureau of Land Management, and local officials who were bought and sold like the Clark County Commissioner who told those coming to support the Bundys to have "funeral plans in place." 3. Grassroots Response - As other incidents have transpired in the past, the amount of time it took honest information to reach the grassroots and thus the response to the action came to slow. In the massacre in Waco, most of the nation had been sold a single narrative from the limited media outlets covering the events. Similarly the events surrounding the abduction of Elian Gonzales from his family in Florida and deportation to Cuba took place in such a response vacuum that by the time Americans knew the real story, the damage was done. 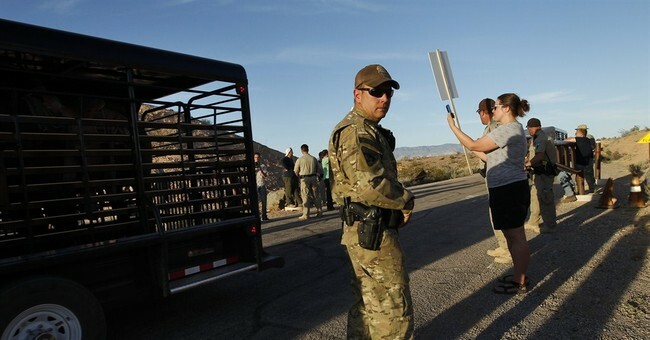 With the Bundy ranch, internet outlets by the dozen had competing information with the limited "official news" being released by the networks, and in most cases the alternative sources had it correct and usually a full day or so ahead of the news cycle. By the time afternoon drive hit, when the network news rooms in New York were preparing their first stories, talk radio audiences had already been dialing their elected officials in Washington demanding action. The majority of Americans saw through the efforts to spin the story in Nevada. Couple that with the leadership failures that the American people view the administration responsible for, from Benghazi to the Affordable Care Act, all it took was the unedited video of federal agents tazing Bundy's son, followed by his pulling the wires from his chest and continuing to stand his ground for there to be comparisons made to the American revolution. It's also important to note that merely pulling back from the Bundy property hasn't settled the matter for the American people either. The feds have stolen 352 head of cattle, and will not confirm or deny if they euthanized some or all of them. Recompense must be made. And to be candid, I wouldn't be a bit surprised to see if a few ambitious law firms don't try to convince the Bundy family of the validity of litigation. For if the federal government is allowed to do it with one, then there will be nothing stopping them from doing it again.